There’s a whole vast world of supposed-to’s; the proper ways to do things. Just so you know, children don’t tend to be very willing residents in this supposed-to world. When you’re trying to instruct them in the ways of this world, quite often they’re just going to apply some whatever-the-heck-they-want-or-happens-to-pop-into-their-little-heads liberally, and maybe add in some finger paints and dirt for good measure. So, it may help to approach the subject of teaching your kid to wash his/her hands without the handicap of parental delusion. There are lots of diagrams online of how to properly wash hands. The sheer quantity is staggering, and they can look like some kind of martial arts for hands fighting each other. Some of them are specifically for teaching kids. They include such crackpipe fantasies as repeatedly braiding your fingers and thumbs for a minimum of 15 seconds (or the equivalent portion of the alphabet song) to ensure proper cleansing, or, get this, using a paper towel to wipe off the faucet and knobs when done. Bwahahahaha! Madness. Let’s consult reality, shall we? The boy was in there for literally three seconds. I saw his hands were wet, I smelled them and they were soapy smelling. He paused with that shifty “this is a trick question, right?” sort of look before saying, “Yeeeeah?” His lack of any comprehension of this being unaccaptable was as plain as the soap bubbles on his still-dirty little paws. Yeeeeah. So! Remember, when trying to teach your kid hygiene, it’s just easier if you do so with both feet firmly planted on reality. And deep breaths. Those are going to be your best friend, trust me. But “helpful” can be so boring, and these are not boring. You’re going to want to sign a petition for the legal manufacture of this product concept. This is why I simply hose my children off before I let them back in the house. My son prefers the one had at a time method…no suds, water everywhere, and wet clothes from drying each on his shirt while washing the other – oh yeah he repeats each hand. Priceless! Art [music] imitating life. Ha ha! Piper pats the tops of her hands with soap bubbles and calls it a damn day. If this is how most kids are, mine must be a neat freak. She spends FOREVER washing her hands…I have to actually cut her off! And she’s only 2! 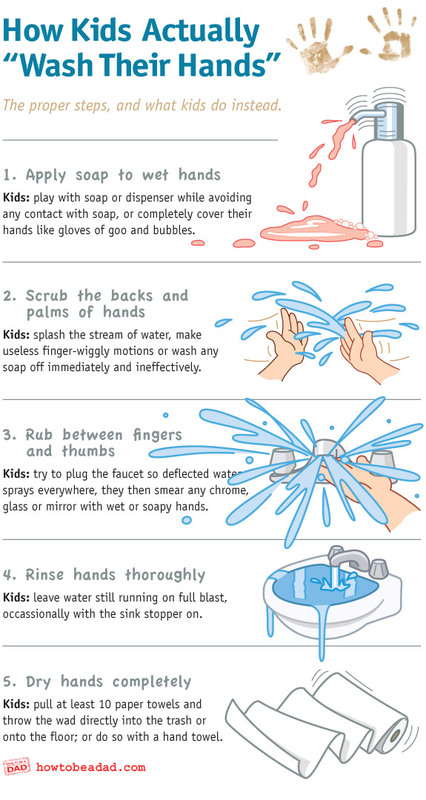 I started having my son wash his hands every time we were in the bathroom when he was about 4 months old – he loved playing with the soap, holding his hands under the running water and even wiped his hands on the towel. I was really hoping that would mean we had an effortless transition into really washing his hands as a toddler… but no. 18 months old and he SCREAMS when we go to wash his hands… then spends about 5 minutes just playing in the water and splashing everything in the bathroom. No soap unless I can wrestle an arm free (he’s 30lbs!!) and rub his hands with soap myself. Ignores the towel completely and screams again when I go to wipe his hands off. Can’t wait until he’s tall enough to use the step-stool and wash them himself… or *thinks about cleaning up ALL that water* maybe I can…. Ahhhhhh the joys of parenting. Ha ha ha ha ha! Oh this is so true, I have 3 kids four and under and it’s like a visit to the water park every time I try to get them all to wash their hands. Hooray! My kids are somewhat normal! Annoying as all get out, but normal! Ha! The “BUT I DID!” is so true! Hahaha! Hilarious and sadly true. But can we talk about the hand drying part in a little more detail for a sec, though? My six year old will take the offered hand towel or paper towel, make mad Tasmanian Devil-like motions with it -tumbling it all around his hands and forearms before dropping it on the floor or into the sink and will walk away from that aerobic exercise with hands still dripping, having managed to get exactly zero liquid onto the towel. How does he do that? THIS! Oh my god, this. Magic. Uncertain whether it’s good or black magic, but it’s magic for sure. Having a new baby sister, we’re becoming experts at hand washing 🙂 We sing “Row Row Row Your Boat” and he loves it. However, I agree it gets a little messy. I reserve hose spray downs for fully body disaster. Like poop explosions. Hoses and songs! That’s what keeping kids clean is all about. Lol! Too true. I think all this applies to bath/shower time as well. With the remnants of dinner still clearly on his face and the days grime not washed off the rest of him at all, we inquired why the bathroom was so wet (walls, floor, ceiling – you know the routine). Apparently he was swimming in the shower…as you do!! Sometimes my 3-year-old washes his hands well…a little too well. We all know any time we are encounter a few minutes of silence with a toddler in the house, first instinct is to RUN. Well, I thought I’d finally triumphed last week when I asked my tot to go wash, and he immediately jumped up, ran to the bathroom, and…disappeared. Running water for a minute became very supicious, and when I went in there he was happily patting soap all over the wall, with the water running as a diversion! Now he asks “Mommy hewp me” whenever I tell him to wash up, and it’s just easier if I do. My one year old just discovered the joys of swishing the water in the bottom of the sink as i wash her hands. She thinks she is a ‘big girl’ washing her hands and drying with the towel. It stsrted off cute, but now she sticks her hands in all sorts of muck to see when i will wash them rather than a quick 1,2 with a baby wipe. My daughter is 2 and since 6 she loves playing with water we have to cut her joy after every hans wash. While I haven’t used this it would probably work on kids. Soap that changes colour. The trick is you have to wash for long enough, and vigorously enough to get the colour to change.